A lunar orbiter being builtby India may be hauling a U.S. radar experiment designed to help unravelwhether the Moon's poles contain pockets of water ice. The device is a small,lightweight, low-power imaging radar developed by the U.S. Department ofDefense. It would be attached to Chandraayan-1, a lunar probe now being builtby the Indian Space Research Organization (ISRO) and headed for a September2007 liftoff. The miniature-syntheticaperture radar - mini-SAR --- would be delivered to ISRO as a flight module byFebruary 2007. The miniature imaging radar instrument has been approved by ISROfor inclusion onboard Chandraayan-1, but awaits a U.S. State Department go-ahead. A similar, but morehigh-tech radar unit could be added to NASA's Lunar Reconnaissance Orbiter as atechnological demonstration, although the outcome of on-going discussion aboutthis prospect is uncertain. If flown on the NASA lunarorbiter, the radar could work in tandem with Chandraayan-1 in surveying theMoon for evidence of water ice. Last month, NASA selectedthe Moon Mineralogy Mapper (M3) to fly as part of the scientific payload forthe Chandraayan-1 mission. The M3 is designed to create a mineral-resource mapof the moon. It will be flown as part of the Chandraayan-1 mission if it isselected by ISRO in an independent competition. The principal investigator for M3 is Carle Pieters of Brown University in Providence, Rhode Island. The final confirmation of the M3 investigation,however, is subject to successful negotiation of an international agreementbetween NASA and ISRO. The U.S. mini-SAR would chart the Moon's poles, radar-scanning for water ice thought to bepresent in permanently shadowed lunar craters. Finding such a resource would beuseful for future expeditionary crews. Armed with the right processing gear,water ice could be transformed into rocket fuel and oxygen to help sustain alunar base. "We've been informedby the India Space Research Organization that our payload has been accepted,pending funding and export approval. We have the funding, but are stillworking on getting export approval from the State Department," said PaulSpudis, a space scientist at The Johns Hopkins University Applied PhysicsLaboratory (APL) in Laurel, Maryland. "We are on schedule to design,build, and deliver the flight instrument in early 2007." Spudis is a co-principalinvestigator of the mini-SAR instrument/experiment, along with ChrisLichtenberg of Naval Air Warfare Center, Weapons Division at China Lake, California. Spudis told SPACE.com that the goals of the mini-SAR are to map the lunar polesand their deposits. "We are focusing only on the poles, to keep ourdata and power impacts to the spacecraft at a minimum." The mini-SAR onboardChandraayan-1 should be able to identify any materials with "unusualscattering properties". That information -- melded with data aboutcomparable deposits on Mercury and icy satellites around other planets -- wouldidentify locations of lunar ice, Spudis said, as well as lead to estimations ofthe extent and purity of that ice. The mini-SAR was proposedfor NASA's Lunar Reconnaissance Orbiter (LRO), Spudis said, but the device wasnot selected to be onboard. LRO is the first spacecraftto be built as part of the Vision for Space Exploration, put into action lastyear by U.S. President George W. Bush. LRO is slated for a liftoff in the fallof 2008. The LRO underpins NASA'sinterest in replanting human footprints on the Moon. President Bush has calledfor the space agency to conduct the first extended human expedition to thelunar surface as early as 2015, but no later than the year 2020. Work on a second mini-SARis underway, hardware that would be similar to the unit on Chandraayan-1 - butfeatures technology that is restricted by U.S. policy for shipment abroad. If carried by LRO, themini-SAR would be a NASA, Department of Defense technology demonstration, andnot principal investigator led. If LRO does fly in 2008, it could be operatingat the same time as Chandraayan-1's two-year mission. At this moment, there hasbeen no competitively-selected SAR imaging experiment designated to fly on the2008 LRO mission, said Jim Garvin, NASA's chief scientist in Washington, D.C.
Office at NASA's Goddard Space Flight Center," Garvin toldSPACE.com. 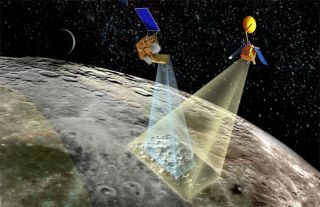 "Should any additionalexperiment be imposed on LRO, it is the view of the project and leaders of NASAin systems engineering, that it would require the mission launch date to slipinto 2009," Garvin added, a decision that would also trigger such thingsas adding additional risk due to mission complexity and more fuel loading. Spudis said that, ideally,if two radar-carrying spacecraft were in lunar orbit, compatibly configuredwith radio frequency equipment, bistatic imaging could be done. Bistatic simplymeans that the transmitter is not co-located with the receiver. "Bistatic imaging hasthe potential to definitively resolve the water ice issue," Spudis said.The technique can be used to distinguish between surface (roughness) scatteringand volume (ice) scattering, he said. "Such a series ofmeasurements would greatly add to our confidence that we are indeed detectingice and produce detailed maps of its distribution," Spudis advised. "Of course, a bistatic radar mapping experiment could be done by any twosatellites carrying the instrumentation...whether one of them is LRO or not."